We are a rich land of heritage, culture, history. And India and it’s royalty has been a patron of art and magnificence. While the royalty and grandeur spell jewellery, the opulence and regal grace and charisma of the royal pieces of jewels is synonymous to royal identity and status, power and flamboyance. The Tanishq, Jewels of Royalty is an ode to this brilliance, to this patronage of royal splendour, the pride of this heritage, an ode to the royal master creation of Nature, the Woman !! Each piece of this collection recreates you as you adorn them and I could feel I’m travelling ages and time, playing various women from the chapters of history–the history of art, cultures, glamour. Tanishq is revitalising and breathing in oxygen into the history and beauty, the sets are an inspiration from the royal houses of Patiala and Baroda and many more. Jewels of Royalty are befitting for every occasion, every moment, they define every mood and season of a woman, every hue and flavour of her brilliant beauty. Yes, the uniqueness of every one of us is impeccably been translated into a masterpiece of jewel that makes you feel Iike a poetry that is heard again and again and applauded, the song of beauty and romance, the Goddess who is worshipped by her Lover to times infinity… !! Understanding this essence of modernity and revival of the grace and timeless beauty of these necklaces, I have styled my first look in a typical Hollywood Vintage way. I wanted to adhere to the contemporary twist of Tanishq so this look was born- an amalgamation of sensuality and sophistication which are seen as opposing qualities when they are not. 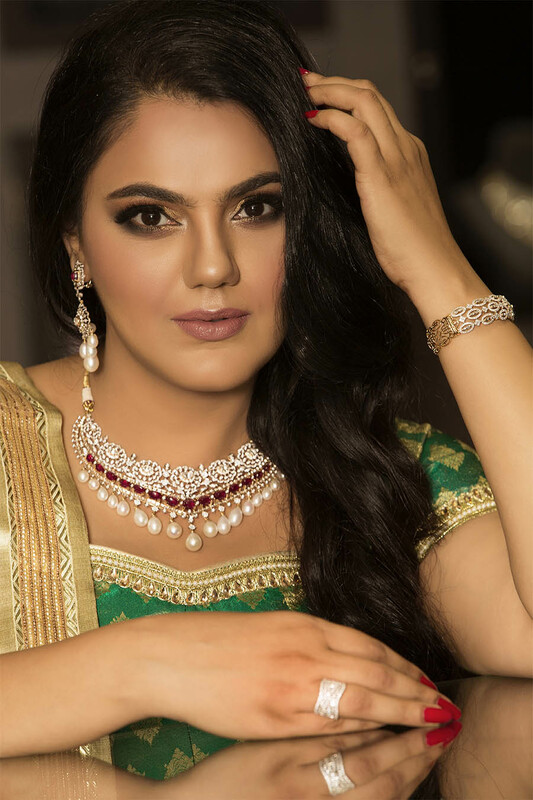 The imperial beauty of this tassel effect diamond set with semi precious green stone taking the centre stage is what makes it befitting for any occasion. Brilliance is never just confined to few festivals but it is an ongoing affair. 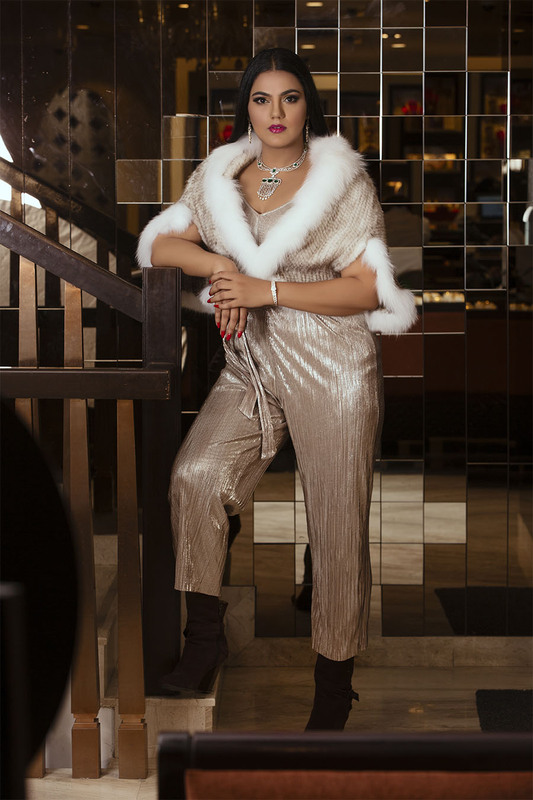 The second piece is fabulously rich and passionate and speaks for itself, it spells the unsaid glamour and charisma of a royal stature and upholds the grace and majestic look all the way. 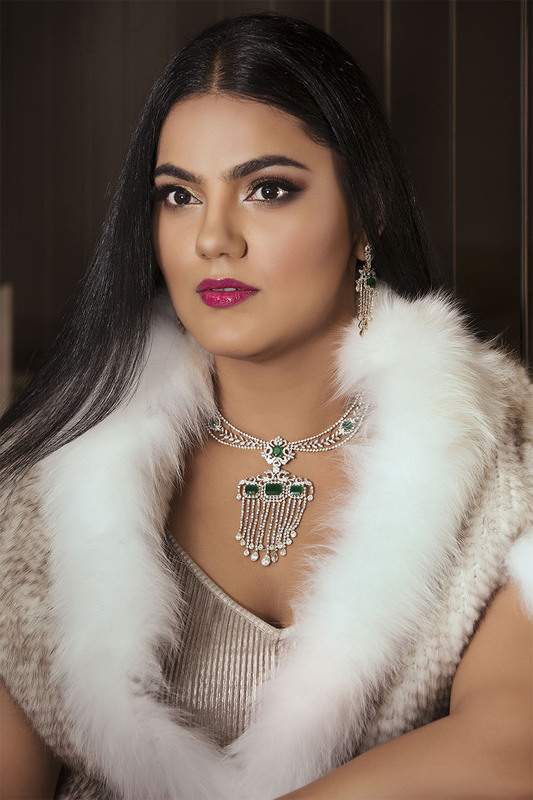 This is a cascading three tiered diamonds, Polkis and green gemstones set which is inspired by the Maharaja of Patiala, Yadavindra Singh. Reimagined by the Patialas, the diamond swirls and the swaying pearls highlight the carved green stone. I have again worn it with an off shoulder in satin and floral skirt giving it an indo western feel. The emphasis still lies on the fact that why not incorporate this kind of jewellery free from curtailment of one kind of dressing. The sets were many and every set steals my heart and my perpetual appetite could not be restrained and Tanishq gave reins to my passionate affair with myself for I only felt like the rare royalty who reigns. This radiant necklace is laid into intricate floral motifs and is highlighted by red sugarloaves that perfectly reflect rich imperial heritage. The Benarasi lehanga I have worn with this necklace is my mother’s saris that she had done into lehanga and choli with the graceful odhni for me last year.